UK Poker News has, since April - ahead of the first event at the Gutshot Club in London at the time - highlighted The Showdown Poker Tour at every opportunity. We welcomed the Tour's formation as an additional high-profile poker tour in Europe, reported on the inaugural event and the follow up in Dublin and publicised the remaining scheduled events. The Vilnius date has never been confirmed and has since disappeared from the schedule. The events in Trouville, France, and Tallinn, Estonia were due to be held in early and late August respectively. Both were postponed. "Due to the current changes in the French gaming laws, our Trouville event in August will be moved to another casino within the Lucien Barrière casino group later this year. We are looking forward to releasing the new venue shortly." "The Showdown event in Tallinn will be postponed since the summer's large tournaments left too little room for the event." The latter reason seems a little vague given that it was publicised in March as one of the legs of the Tour. We can only speculate that its meaning is that too few players wished to play after the WSOP and the countless other events that now crowd out the poker calendar. In many ways this is not surprising. In the UK alone, there has been plenty of evidence of tournament fatigue with major local events not selling out to capacity. At European level, the now well-established European Poker Tour is about to commence Season 3 in Barcelona. It didn't help future publicity when the first two Showdown Poker Tour events that were actually held (London and Dublin) attracted a mere 23 and 21 players respectively, and four of these were under their Hendon Mob commitment. With just the top three or four places receiving prizes in those circumstances, poker players are seemingly not prepared to risk putting up the substantial €5,000 buy-in plus a hefty casino fee (6% or €300 at most venues, but 11% or €550 at the next leg in Denmark!) when the first prize is only likely to be modest. Contrast this with the imminent EPT event in Barcelona. The buy-in is set at €4,800 + €200 fee and the Main Event is sold out to its 480 player capacity. The prize money is in serious Euros! The Showdown Poker Tour was ambitious from the outset, as evidenced by the entry buy-ins of €5,000 for each (plus the substantial registration fees at each card room) and a whopping €10,000 (plus €500 fee) for the Grand Final event at Hamburg, Germany, in November. "Our aim is to create a poker tour truly for the players. It's all about being truly independent, more 'down to earth', having better venues and a player friendly structure. 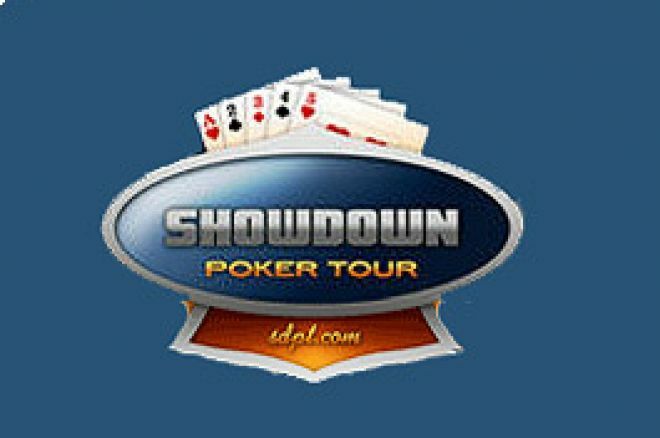 This is in short our aim with the Showdown Poker Tour. "The Showdown Poker Tour includes both well established and brand new poker venues across Europe. Furthermore, by joining forces with some of the most professional tournament director forces in the world you can expect a number of exciting and true player-focused events." "Each final table will be televised and broadcast on TV stations across Europe, culminating in sixteen hours of poker on TV. The Hamburg event is to be the Grand Final with a buy-in of €10,000 and an estimated prize pool of €3,000,000, with the winner taking down an estimated €1,000,000." Whilst those figures appear unlikely to occur based on the current trend, UK Poker News, as a supporter of UK and European poker initiatives, hopes that the Showdown Poker Tour meets with eventual success. We will continue to keep an eye on developments.